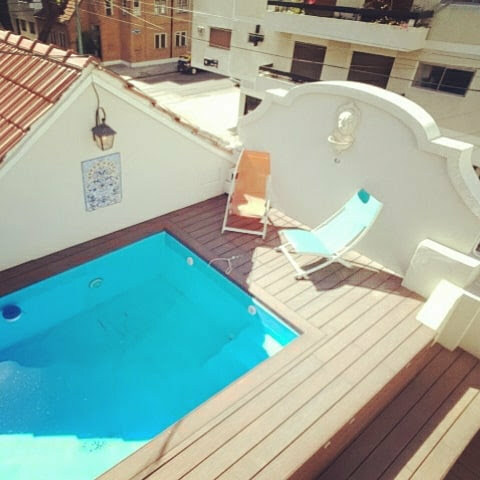 The pool deck not only serves as a sun deck, but also integrates the pool with the rest of the house and roof terrace. First we had to choose either between real wood, plastic or a mix of artificial and real wood. We looked at these three options and discussed it with people who installed it in their own garden or terraces. But the fact is that you cannot escape regular annual maintenance with real wood, one thing we definitely wanted to avoid. On the other hand, 100% plastic is getting really hot with sun shining on it, and as we have children going in and out, therefore was also deemed impractical. Besides that, another plastic wood disadvantage is that it deforms with high temperatures, basically melt, so there were not that many options to choose from. 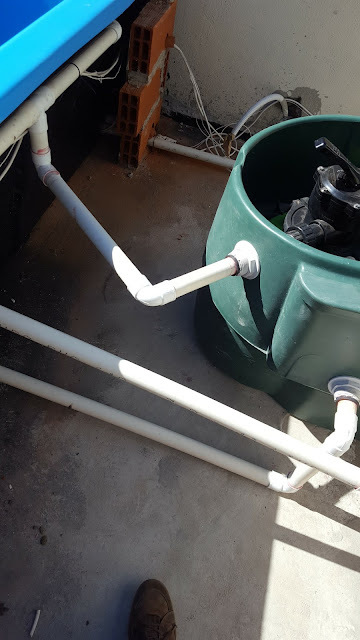 So the final choice was to use a mix of plastic and real wood that does not need any maintenance nor gets overheated in the sun. After 2 years of use, we concluded that that was definitely the right choice. 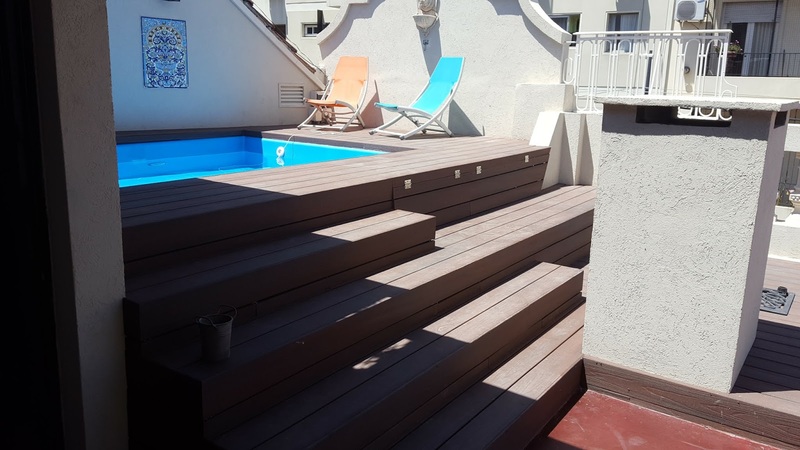 We had a sample of high quality wood, and after the same time we had the mixed material deck, the quality wood showed signs of being dried out, while our deck stayed in great shape. 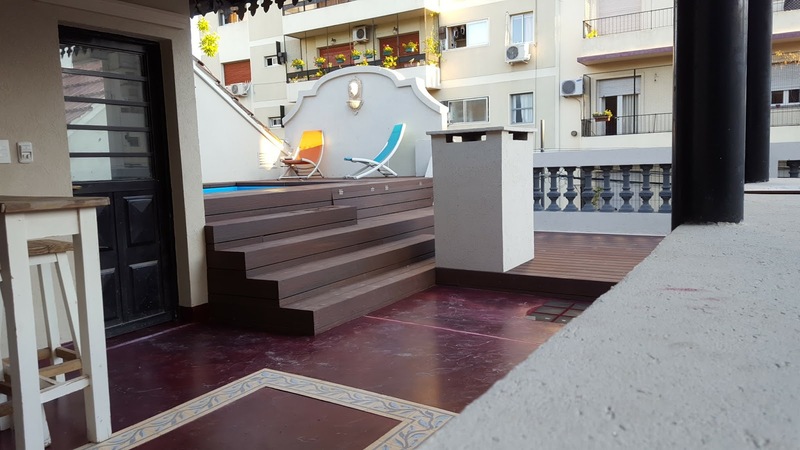 And with 40 degrees Celsius sunshine, we were still able to walk on the deck, though you need to be quick, but it did not get as hot as plastic flooring. With the architects, we decided we wanted to have stairs to lead to the swimming pool as well as a seating place to relax. Also we wanted to have space to put sun chairs up and below. The seating space also has doors built in, so we were able to store pool accessories and materials. 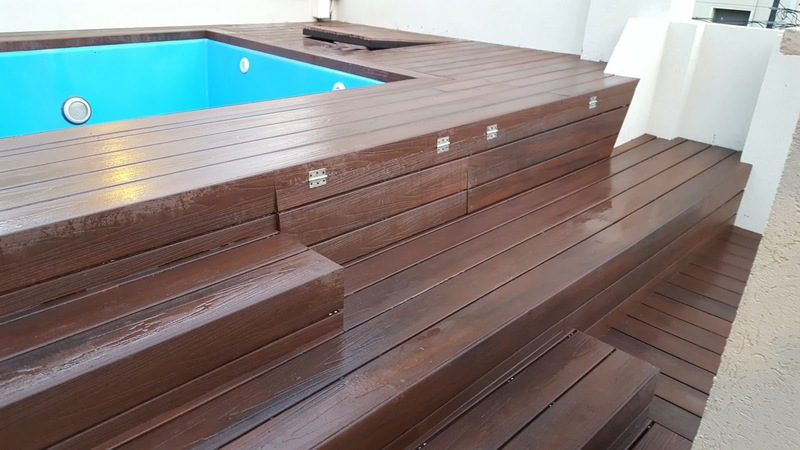 The deck is built with a metal harness structure below to support the pool and the wooden panels. The fiberglass pool is supported by brick walls from its sides to ensure the pool keeps its shape with the full weight of the water. 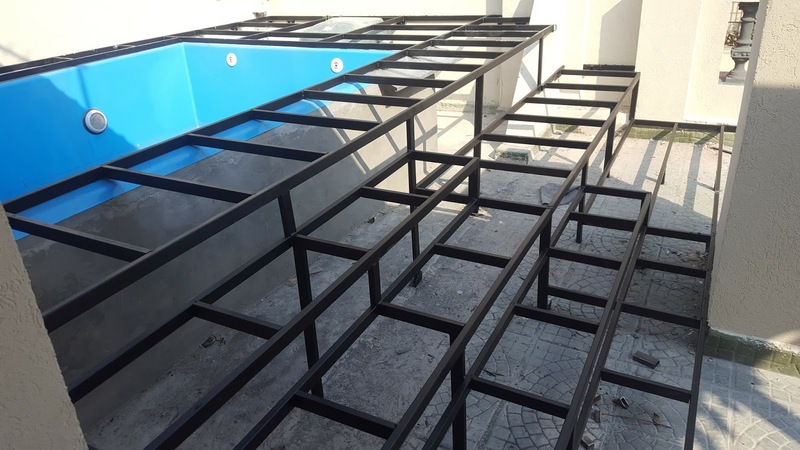 As the pool is installed on a roof, we reviewed with a construction architect how to support an approximately 10,000 kg of weight.The result was to install 4 T-shaped metal bars, inter-spaced 1 meter from each other, horizontally on top of 2 supporting house walls below. The pump and pool filter are integrated below the structure and deck. 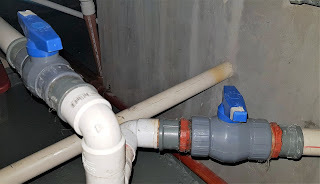 The piping connects the pump with the jets, the waterfall and the pool exit for water circulation. With a clock it filters the water 2 hours per day automatically, that is sufficient to keep the water clean and at quality level. 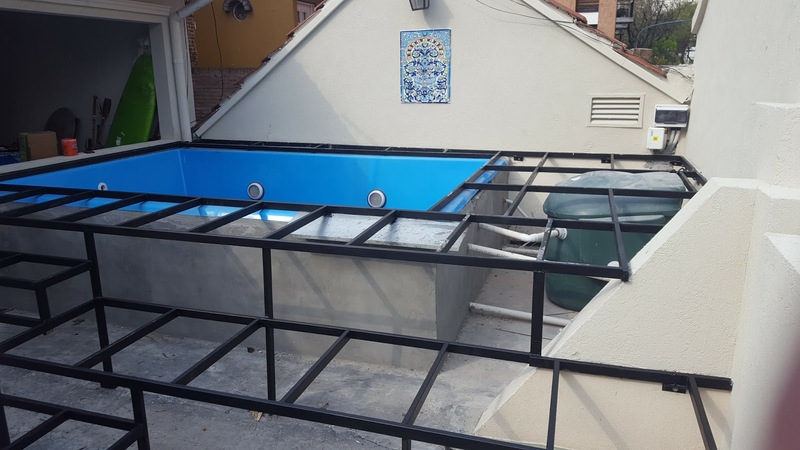 The pool pump has a capacity of 12 thousand liters per hour throughput and a sand filter and is accessible through a horizontal door in the upper deck. Obviously as being installed on the roof, the floor was put with a waterproof membrane to avoid any leaks. 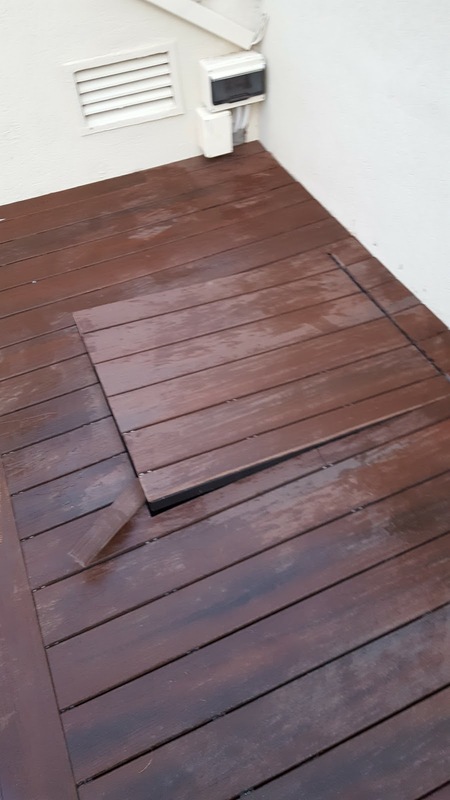 We also installed a drain below the deck near the pool to take out any water leaving the pool. 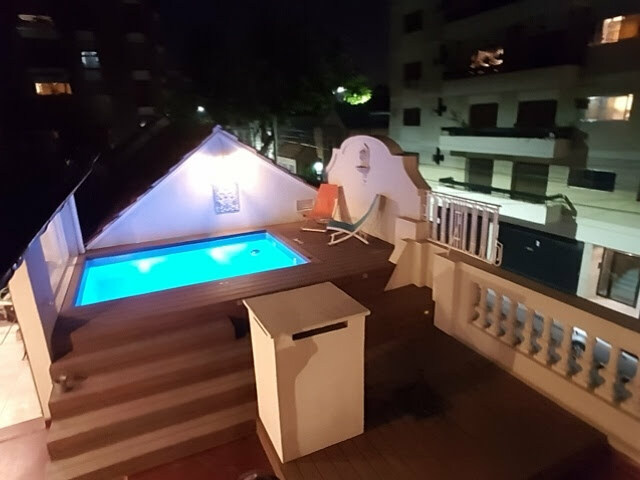 The end result is a deck that integrates well the pool with the roof terrace while also providing additional features such as sun deck and seating space. We enjoy it every day. To see more details on the pool and waterfall, click on the post Swimming Pool or one of the in the menu.